The ‘Middle’ Ages: What’s in a Name? Like many European concepts, the Middle Ages is one which eventually reached all parts of the world, shaping how people think about Europe and its people. Like many European concepts the Middle Ages is one which eventually reached all parts of the world, shaping how people think about Europe and its people. The ‘Middle Ages’ is in reality an awkward term with which to explore the centuries between 500 and 1500. It suggests that this was a time of arrested motion, a time between two other important epochs that define its middle-ness. 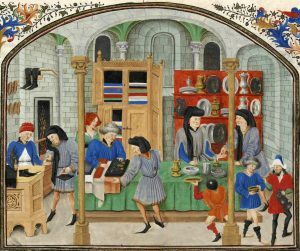 Those who coined the term Middle Ages possessed a tremendous sense of their own worth and good fortune as members of a later age. Media aetas, that is, Middle Age—was first used by the poet Petrarch (1304–74), followed in the next century by statesmen and historians like Leonardo Bruni (c.1370–1444) and Flavio Biondi (1392–1463). These were men of politics and letters who fostered a style consciously engaged with the study of classical texts and ideas, with humanism, as they called it. They celebrated their times and their cities, and above all each other. Leaders, preachers, and public intellectuals often announce the dawning of a new age. 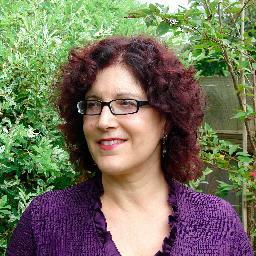 These are not idle statements, but nor are they claims that historians need accept at face value. Humanists like Bruni were proclaiming a particular style of Italian civic living, which enabled artists, poets, architects, and history-writers to refine their skills within courts and cities, with Tuscany as their epicentre. They were privileged communicators of the cultural treasure that had been Rome’s, a culture lost—so they claimed—with the demise of Roman institutions, often marked by the removal of the last western Roman emperor in 476. Such men came to be known as humanists, intrepid raiders of the treasures of antiquity, hitherto obscured to generations of people living in the ‘Middle Age’. This self-awareness—which they were able to express thanks to the patronage they received from princes, popes, and noble families—was displayed with bravura in the poetry and letters they wrote to classical rhythms, and within palaces inspired by the buildings of ancient Rome. When the first history of the period’s great artists was written by Giorgio Vasari (1511–74), he saw the rebirth of classical standards as a welcome change after the ‘Gothic’ age with its soaring pinnacles and pointed arches (Box 1). The Gothic style in architecture is one of the most enduring inventions of our period. It emerged c.1140 in France—at the abbey of St Denis, at Chartres and Sens cathedrals—and over the subsequent decades spread throughout the whole of Europe. It is a style which values great height and the sense of loftiness, its builders sought to embed large sections of windows in walls, and thus to let in light, beautifully coloured by the tinted glass. The Gothic building was like a canvas for sculpted, painted, and glazed decoration: and all this height and light was meant to inspire and lift the viewer towards contemplating divine things. The Gothic style spread through the work of French artists, in Westminster Abbey in London, and in St Vitus’ cathedral in Prague, but many regions—from Sweden to Cyprus—created their own versions. The Gothic also influenced secular buildings: castles, palaces, and town halls, like the magnificent town hall of Brussels. Italy alone, with its powerful classical tradition and its distinctive local political cultures, was able to resist the allure of the Gothic. The humanists sensed they were witnesses to the rebirth—rinascimento—of classical ideas and practices that had been corrupted during the middling period. Hence the term Renaissance, used since to describe their passionate interests in the culture of antiquity. The men who coined ‘Renaissance’ were also convinced that Italy was unique in the excellence of its scholars. In reality scholars and readers from all over Europe participated in the Italian literary culture, widely available thanks to the recently invented print. So let us set aside the ‘Middle Ages’ and ‘Renaissance’ as historically descriptive terms, and note the recurring utility of the ‘Middle Ages’ as a point of reference for people and places in different times. The way we think about Europe between 500 and 1500 is not only marked by the terms ‘Middle Ages’ and ‘Renaissance’. It is also influenced by the availability across the globe of traces of later revivals, appropriations, and introductions of aspects of the ‘medieval’ into public life. The aesthetic values of pre-modern Europe were appreciated in a particularly intense manner in the 19th century. This was for some a reaction against the 18th century Enlightenment whose thinkers emphasized the importance of reason in guiding human affairs, and considered earlier times as ‘barbarous adventures under barbarous names’. 19th century medievalism sought in that past the values of community—before the rise of commercial society and the global markets—and of spirituality, guided by religious faith. Those who opposed the French Revolution and its bloody aftermath often celebrated the qualities of the old European order, the ancien régime—traditional monarchy and established church—as enduring forms of European life, to be cherished—in England or Prussia—or restored, in France. Madame de Staël (1766–1817), a romantic novelist and commentator on the French Revolution, celebrated the Germanic roots of European civilization in the aesthetic of the Middle Ages. Similarly, historian Thomas Carlyle (1795–1881), in his Past and Present of 1843, advocated a new post-Christian ‘gospel of work’, inspired by what he perceived as the ethos of cooperation and labour in medieval monasteries. In the decades which saw the explosion of industry and the coming of railways to large parts of Europe, and with them both opportunity and human misery, the medieval past offered an image of a world lost, a more manageable society which lived at a humane pace and on a more human scale. The designer and social thinker William Morris (1834–96) sought to capture the qualities of craft labour in his emulation of medieval carving and painting. His was not a yearning for Catholic religion, but for village life, where granaries were the true cathedrals of the people. There was a notable revival in Catholic activism and building throughout Europe too. When liberal constitutions and reforms removed centuries-old limitations from Catholic citizens, as in England with the Emancipation Act of 1829, new cultural forces came into play. And so, a Catholic convert like Augustus Pugin (1812–52), son of a French émigré, had his hands full with commissions for Catholic cathedrals, chapels, and seminaries in England, Ireland, and even as far as Australia. The Oxford Movement combined the enthusiasm for medieval values with a call for religious reform and the introduction of rituals that the Reformation had dismantled. In France, Catholic worship, abolished during the French Revolution of 1789, was soon restored. 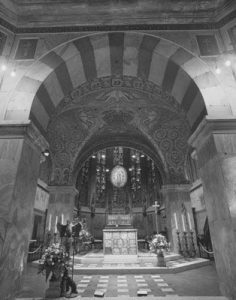 Subsequently, the French state sought not to destroy the ancient Catholic heritage but to restore it as part of the nation’s history. Large projects financed by the state rebuilt—and often embellished—‘Gothic’ buildings, most famously the cathedral of Notre Dame in Paris, with its pinnacles, statues, and gargoyles. Medieval revival was not only a reaction against republican or democratic politics, or the product of Catholic patronage. It also echoed the desires of those who fostered national identities and their expression in nation-states. Nations were understood as being bound by language, history, and landscape, and intellectuals associated with what has been called romantic nationalism—in Germany, Poland, Hungary, or Norway—sought the roots for 19th century national identities in the past. Composer Richard Wagner (1813–83) identified the essence of Germanness in the ancient heroic narratives, which were turned into a poetic cycle in the late-12th century, the Nibelungenlied. In France, the architect and conserver Eugène Viollet le Duc (1814–79) led the preservation of medieval abbeys and cathedrals destroyed during the Revolution as part of a national heritage, for every nation needed a clear sense of its past. The novels of Walter Scott (1771–1832) were widely known throughout Europe; they used medieval settings as a frame for the exploration of courage, ingenuity, and ideals of chivalric masculinity. In England, the present was seen as linked to an Anglo-Saxon past through an unbroken tradition of law and nationhood. When the design for rebuilding the Houses of Parliament was sought through public competition in 1836, the Gothic vision of Pugin triumphed, inside and out. The legislative home of English democracy in an age of reform and industry was associated with the age of Magna Carta (1215). In the 20th century an imagined rural Middle Ages of the ‘shire’ inspired the works of J. R. R. Tolkien (1892–1973)—a professor of medieval English literature—while C. S. Lewis (1898–1963) explored Catholic and medieval themes in his allegorical works, which have become children’s classics also loved by adults. For all these reasons the ‘Middle Ages’ form a point of reference from which we moderns fashion our identities and conduct our polemics. Hence the many complexions it can assume: the ‘medieval’ has been associated in turn with socialism and arch-conservatism, with the cohesion of trades unions and the bombast of royal ceremony. The medieval can serve to animate the identity of oppressed minorities, but also the fantasies of expansion and empire-building. It is a legacy and an opportunity; it offers inspiring examples alongside ones to be avoided at all cost. The Middle Ages is always with us—in the design of our cities, in the treasures of our museums, in music, fantasy games, literature, landscape. 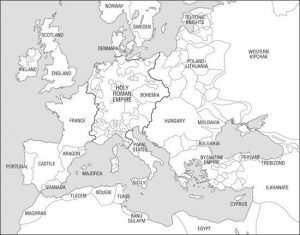 The achievements of the 15th century, so celebrated by humanists, were the continuation of a much longer tradition, which led Europeans to confront—sometimes to reject and often to emulate—the classical cultures of Greece and Rome (Map 1). Antiquity gave rise to diverse religions, philosophies, styles in art and governance, in republics and empires. And between roughly 500 and 1500 this intellectual heritage was explored through reading, copying, and commentary. As they probed that heritage Europeans also imprinted their own stamp upon Latin poetry and prose, Greek medicine and political theory, and on music and architecture too. All spheres of European life—law, theology, political thought, care of the body, religious rituals, and even land tenure—were imprinted by a Roman lore appropriated to varying degrees of imitation and adaptation. A living classical tradition endured above all in the spheres of governance and religion. The late antique Roman Empire was a Christian polity. This resulted from the process launched by Emperor Constantine (272–337), who embraced Christianity in 312 and made the religion licit within the Empire. Those who followed embedded Christianity into imperial life until it became the official religion by the end of the 4th century. Contact with ethnic groups at and near its borders had always been a feature of the dynamic Roman Empire. Erstwhile neighbours, indeed enemies, ultimately joined the Roman world; some even became emperors in the 2nd and 3rd centuries. During the 5th century Germanic groups—like the Goths in 418 or the Burgundians in 443—were accommodated with billeting rights, or allocated land for settlement, and sometimes shares in tax revenue. At the beginning of our period the traditional Roman elite—patrician and senatorial families, owners of estates, and stakeholders in Roman political and economic achievements—continued to serve under Germanic rulers. They were educated in the curriculum of the Arts, a rigorous education in logic, composition, and public speaking, alongside training in computation and science. They brought these skills to the important offices of bishops and governors. 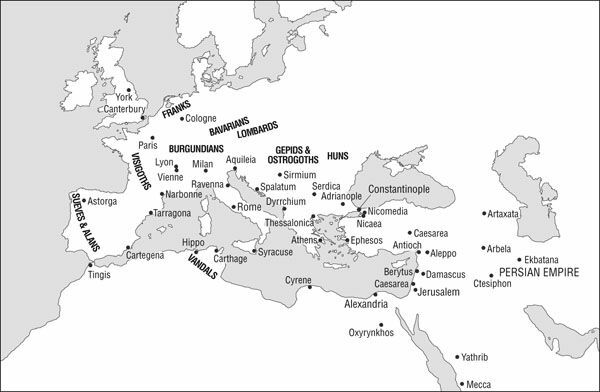 From the end of the 3rd century the Roman Empire was in fact managed as two large and interconnected entities: east and west. The western part saw in 476 the deposition of the last Roman emperor Romulus Augustus, by a military leader Odoacer (433–493), who led a federation of Germanic people, and who thus became king of Italy. This change is often used to mark the ‘end’ of the Roman Empire. It is, in fact, but a stage in the long process by which Germanic groups were incorporated into the Roman armies, garrisoned its borders, settled on state lands, and ultimately also claimed political rule. Odoacer was soon replaced by Theodoric (454–526), king of the Ostrogoths, as ruler of Italy. In 497 Emperor Anastasius—ruler of the Empire from Constantinople—recognized Theodoric and sent to him the regalia of office. Theodoric built his capital in Ravenna as a new Rome. He appointed court poets who could celebrate his achievements in the Roman imperial style, and maintained the circulation of Roman gold coins. He saw himself as a Christian king—loyal to the Arian branch of Christianity which Constantinople considered a heresy—within a Roman tradition. Similarly, after Clovis, king of the Franks, converted to Christianity in 496, and established regional hegemony by defeating the Visigoths in 508, he too received the Roman title of consul from the same emperor. Through diplomatic contacts with Constantinople, and interaction with local Roman elites, barbarian kings learned how to rule in Roman style. A Roman civic culture had for centuries animated life in the imperial provinces. Vast investments were made from the imperial coffers in public works and military defences. When these declined in the 4th and 5th centuries, so did the number of city dwellers in Italy, Gaul, and Spain. But the teaching of Latin continued, as did the training of public servants from among the traditional elite of senatorial families. Roman law was practised and people still walked streets laid out in the unmistakable grid of Roman urban planning. Public spaces and practices, like aqueducts, hippodromes, temples, and gladiatorial games were transformed to fit a Christian society. The Pantheon in Rome was turned into a church in 609, dedicated to the Virgin Mary and All Saints. The kings of the Ostrogoths, Vandals, Franks, Burgundians, and Visigoths were Roman barbarians, leaders who cherished what Romanitas—Romanness—had to offer. And so, while many have described this period as one of decline and fall of the Roman Empire, a concept popularized by Edward Gibbon (1737–94) in his best-seller The Decline and Fall of the Roman Empire (1776), this period of change is better considered as one of transformation. That is to say that adaptation rather than destruction characterized the fate of the Roman legacy, and this resulted from intensive—often violent—interaction between peoples. As the barbarians became Romanized—willingly and alert to the benefits of Roman practices—a hybrid culture emerged. An early-6th century food and health book composed by the Greek physician Anthimus for Theuderic the Great, king of the Franks (c.485–533), subtly acknowledged the Franks’ customs while aiming to instil Roman values. Anthimus accepted that high-born barbarians preferred to drink beer and mead—an abomination to any self-respecting Roman—but also recommended the importance of decorum in handling and preparation of food, and consumption of moderate portions. This etiquette stands in contrast to contemporary descriptions—condescending as well as misunderstanding—of barbarian male sociability. Sidonius Apollinaris (430–89), son of a Gallo-Roman senatorial family, diplomat, poet, and then bishop of Clermont, described the Burgundians as reeking of garlic and onion, and as giants who spoke an unintelligible tongue and who groomed their hair with rancid butter. The continuity of ideas and practices in public administration and economic life was facilitated by the existence of a sole emperor, in Constantinople. Emperor Justinian (c.482–565) attempted to re-establish a sole imperial authority around the Mediterranean—east and west—in regions that for a century had been ruled by Barbarian successor states. He also extended the Empire—now called Byzantium and largely Greek-speaking—eastwards, with triumphs over the Persian Sassanids and the Armenians. His success in battles at sea and on land was matched by ambitious campaigns of construction. Court historian Procopius (c.490–c.560) lovingly describes edifices in Constantinople and in the Holy Land, building projects through which the imprint of the Christian Empire was felt. Even more far-reaching for the lives of individuals and communities were Justinian’s legislative efforts: he commissioned a compendium of imperial law, Justinian’s Code, updating Theodosius II’s laws of 438; a Digest of learned opinions on questions arising from legal practice; and a law textbook with helpful commentaries, the Institutions. Under Justinian theological controversies on the nature of Christ animated eastern and western bishops alike as one Christian commonwealth. Soon after, in 568, the Lombard conquest of large parts of northern and central Italy diminished such contacts. Gold coins now carried the portraits of kings rather than emperors (Figure 1). Coins issued in late 6th century Provence still retained the imperial shape, though they were lighter in weight. 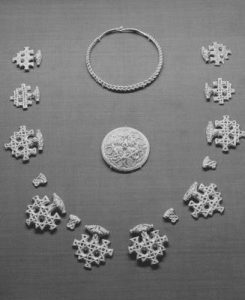 Coins facilitated trade in luxury goods that were still available throughout the old Roman provinces, not least in the new royal courts and for ritual use in churches and cathedrals. Coins eased the collection of taxes by a cadre of administrators, officials who still carried Roman titles and who were paid by barbarian kings from the public purse. 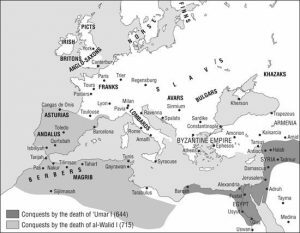 The Mediterranean empire that Justinian had sought to revive was soon transformed by the advent of a new force in world history: Islam (Map 2). Born in the Arabian Peninsula, Islam arose from the convergence of diverse traditions, including Judaism and Christianity. It was an exciting new religious ideology which mobilized kinship groups into military action, first in the peninsula and then beyond. The fragmented and battered Byzantine Empire, which had seen loss of territory and income in the decades following Justinian, offered easy pickings. A decade after the death of Mohammed, in 637, Jerusalem was taken by Caliph Umar, the crowning of his conquest of Byzantine Syria and Palestine. Next he mobilized an army which entered Egypt in 639, and brought it into the fold of the emergent Ummayad Caliphate with its capital in Damascus. Muslim conquest was led by Arab armies, but these were locally re-inforced by converts to Islam, by defeated Byzantine garrisons, and by alliances with local groups, such as Bedouins in the Sinai, and Berbers in north Africa. These developments soon had dramatic implications for Europeans: the Mediterranean islands, southern France, and Italy suffered from raids and by 711 large parts of Iberia were conquered by a Muslim army from north Africa—led by Tariq ibn Ziyad. Muslim armies soon crossed the Pyrenees into the Gallic province of Septimania too. Roman-Visigothic cities like Barcelona and Narbonne were taken, but progress deeper into Gaul was halted. This border of Christian/Muslim rule in southwest Europe was held for a generation, until the Franks reclaimed Narbonne in 759. Many of the old Roman provinces now lived under Muslim rule. In Iberia, Visigoths converted in large numbers to Islam as did some Jews and a great number of Christians; and Gothic identity has left a faint echo in the Arabic name al-quti—the Goth. The mental map of Christianity was shifting. Even though the Pyrenees were for centuries a marca—a border territory, march—with intermittent violent encounters, al-Andalus—Muslim Spain—exerted vast cultural influence upon the rest of Europe. The shape of Europe was thus dramatically affected by these conquests. They created in Iberia and southwest Gaul a culture so diverse and alliances so unexpected, as to challenge our concept of medieval Europe. Iberia also saw the coexistence of Jews, Muslims, and Christians—as unequal neighbours—in a manner which has come to be known as convivencia—living together—within a sphere of Arabic culture. We will return to this legacy for Europe in a later chapter. Another important concept—crusade—was born in these parts. By the 11th century knights from Francia—as Frankish Gaul came to be known—received papal blessing when they joined the efforts to conquer lands ruled by Muslims, and thus to join what came to be known as the reconquista. The balance of political power in Christian Europe now shifted northwards, away from the dangerous Mediterranean. There, the Merovingian Franks gained prominence through conquest and consolidation of their administration of vast lands, which reached from Denmark to Saxony to Lombardy. Court ritual and art emulated the sole source of imperial majesty—the imperial court in Constantinople. But as the Frankish kingdom prospered, a rivalry developed between the two polities. In a period of particular turmoil in the Byzantine Empire, theologians and courtiers in the Frankish court even challenged the Empire’s leadership in religious matters. During the rule of Empress Irene (752–803)—and exploiting the political vulnerability which often accompanied the rise of a woman to the throne—they penned theLibri Carolini in 794. This tract discussed and extolled the role of images in Christian worship, a polemic against the iconoclastic austerities which had recently been adopted by three successive Byzantine emperors. Political hegemony received religious endorsement in Rome on Christmas day 800, when Charles the Great (c.742–814), king of the Franks—also known as Charlemagne—had himself crowned by the pope as emperor. Beyond the old Roman provinces the Roman legacy was developing into something new. While Roman cities and law were densely available in Italy, Gaul, and Spain, they were less visible and accessible in northern Europe. Yet Romanitas in the 7th or 8th century was invested in other ideas and practices. The language of religion, ritual, and learning was Latin, and churchmen were best placed to teach its uses. Classical learning was favoured because it was extremely useful for communication and governance. So, for example, the Rhetorica ad Herennium(Rhetoric for Herennius), a textbook on rhetoric composed in the 90s BCE, remained one of the most widely used manuals for any holder of public office in church or state. Every monastery had a copy, every cathedral, and every court. 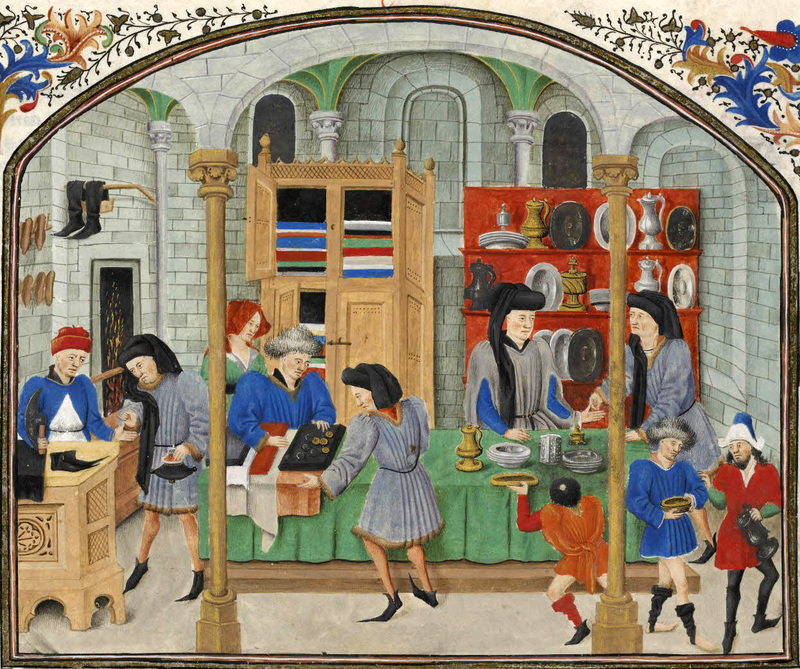 Similarly, the book of medical recipes,Materials of Medicine, by Dioscorides (c.40–90 CE), an army surgeon from Asia Minor, was one of the most popular books well into the 16th century. It was cherished for its diagnostic insights and for the botanical cures it offered. A lively engagement with the classical tradition characterized many areas of life in these centuries. Books written in antiquity were copied, but also annotated; medieval users added glosses and even practical illustrations to books of medicine and geography, history, and poetry. These traditions were appreciated for their benefits, tested against contemporary needs. Charlemagne explored the possibilities of Christian culture and Roman education in his court at Aachen (Figure 2). He assembled a formidable group of scholars and administrators, who made tangible the idea of Christian–Roman–European rule. Emperors were greater than kings; they led Christian life and extended it to new peoples; they legislated and determined in issues of faith. Emperors had at their disposal not only unique regalia—crowns, rings, and sceptres—but incomes, rights, and rituals of court. In the 10th century a Saxon dynasty—the Ottonians—established itself as heir to the Holy Roman Empire between 936 and 1024. The Ottonians reinforced their claims to ascendancy by arranging marriages with the Byzantine imperial family, and by promoting—as Charlemagne had done—enterprises of conquest, court art and architecture. Fittingly, they were also great patrons of monasteries and their learning. The Byzantine Empire was experiencing vast change, as its territories were depleted by Muslim extension into Syria, north Africa, southern Italy, and Sicily. But an arena for expansion existed to its north and northwest, among the Bulgars, Poles, and the people of Rus’. Christianity was brought by Greek missionaries like the saintly brothers, Cyril and Methodius, to Moravia and Pannonia. Byzantine culture spread through church rites, conveyed in the new alphabet which the missionaries helped to devise, and which developed into the Cyrillic alphabet, still used today throughout eastern Europe and parts of Asia. The Byzantine Empire was battered by the movement of peoples like the Seljuks from central Asia in the 10th and 11th centuries. The nomadic Seljuks converted to Islam and became a dynamic military force in pursuit of conquest for their new faith. The waning of Byzantine religious solidarity and influence in the West was marked from 1054 by the schism between Greek and Latin bishops over the theology of the Trinity. The history of the Byzantine Empire will be told in the Very Short Introduction to Byzantium. For all the challenges it faced, the Byzantine Empire could still be an important ally in European enterprises. When an armed pilgrimage—later to be styled ‘crusade’—left Europe in 1096 with the aim of offering help to the Christians of the east and regaining access for Christians to the Holy Land, its leaders expected that help would be forthcoming—in food, troops, and logistics—from the Byzantine Empire. Emperor Alexios I Comnenos (1056–1118) was, in fact, alarmed by this assumption. His daughter and biographer, Anna Comnena (1083–1153), describes with bemusement the arrival of the contingents from the West, each expecting to be received in style and supported. 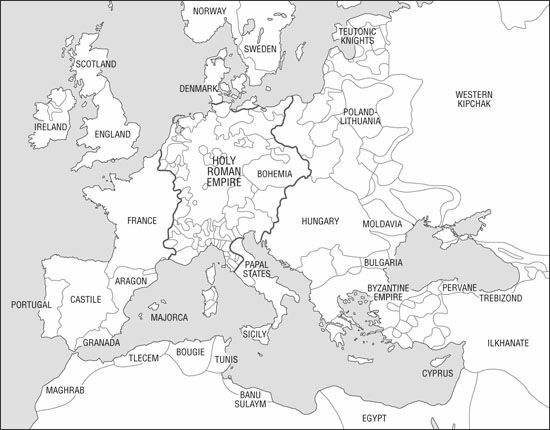 While this transformation of the Mediterranean and Gaul was under way, change also characterized the British Isles, Scandinavia, and central Europe. Following the withdrawal of Roman forces around 400, throughout the 5th century Angles, Saxons, Frisians, and some Franks migrated and settled in southern and eastern England, often penetrating further inland though the rivers Ouse, Trent, and Nene. The Germanic settlers sought agricultural land, and often displaced native Celtic communities, forced to move further west and north. This period was to be remembered and re-created in later centuries in the traditions associated with Arthur, king of the Britons, who was revived in the 12th century, and would remain thereafter the epitome of a chivalrous Christian king. Southern England became a region of active mission c.600 with the arrival of the delegation sent by Pope Gregory I. Like elsewhere in Europe, conversion was led by rulers, animated by charismatic missionaries, and often bolstered by Christian queens. Throughout the British Isles the influences of holy men from Ireland was felt. The Life of St Columba (d. 597), written a century after his death by the monk Adomnán, describes the holy man at work from the island of Iona off the west coast of Scotland, admonishing chieftains, prophesying the results of battles, exorcising demons, and confronting magicians with his own cures. Irish influence affected the style of religious life—the calendar, the monastic ethos—often at odds with Roman–Continental practices. From Christian Francia abbess Bertila (d. c.704) sent books and relics to these ‘new’ Christians. In time the term ‘Christendom’ was coined by an English writer, and figures from the British Isles became iconic Christian leaders: the Northumbrian monk-historian, Bede (673–735), whose history of the church was highly appreciated throughout Europe; or Alcuin of York (c.735–804), who spent much of his life in Charlemagne’s court, leading reform of education and acting as diplomat between England and the Continent. This integrated northern European world, Christian and increasingly organized around dynastic rule, was about to be devastated by violent disruption: raids by Norsemen, first attested in 789. Several decades of violent contact followed, first of the more exposed outposts, like the monastic islands of Lindisfarne or Iona. The north of England, east Midlands, and parts of East Anglia, as well as northern parts of Francia, were all affected. By the mid-9th century a period of settlement and consolidation was under way, and York and Dublin became important Norse trading centres. Ultimately, after decades of dislocation, enduring forms of cohabitation emerged: the Norse leader, Rollo, paid homage to the king of France in 911, for the terrain of Normandy. In Wessex, the Viking challenge had prompted the enhancement of administration and defence under King Alfred (849–99) (Figure 3). Christian ideas and practices were now disseminated to those who joined the European commonwealth as a package of religious teaching, liturgy, law, and letters. These processes were mutual and reciprocal. Magyars, Bohemians, and Norse people continued to live in kinship groups with their intricate patterns of mutual protection, immersed in a heroic ethos. They were choosing to join the Christian world with its big idea: salvation offered by a suffering God. For them the figure of Christ was that of a hero, who had triumphed over death. By the year 1000 the European population had begun to grow, and for some 300 years food production grew too, more than matching the demand. This meant that some people from every rural community could move to towns and cities and develop specialized skills, safe in the knowledge that food would be available there for purchase. Urban growth occurred both in existing urban centres—old Roman cities—and in thousands of new towns. This process has left its mark on European place-names which announced their newness: Neuville, Neustadt, Newtown, Castelnuovo, or Neukirchen. Cities became hubs of cultural activity—in cathedrals, schools, and town halls—alongside the traditional rural cultural strongholds: monasteries and aristocratic households. Resources, enthusiasm, and talent were now invested in new institutions of religion and learning, and that is why a century ago the American historian Charles Homer Haskins (1870–1937) called the period ‘The Renaissance of the Twelfth Century’. Members of the social elite, enriched by the agricultural boom, founded monasteries where their families, past, present, and future, would be commemorated in prayer; townspeople supported schools for training in scribal arts, law, and medicine. Conquests led to waves of building, like that following the Norman Conquest in England, or when territories were conquered for Christian rule in Iberia. Dynasts marked their unique destinies in prestige projects like the abbey of St Denis north of Paris for the Capetian dynasty, or the rebuilding of the church of the Holy Sepulchre in the crusader-founded Kingdom of Jerusalem. While much classical learning was well established in Europe, some classical lore became available to Europeans only in the 12th and 13th centuries through a two-step process of transmission. In the 7th and 8th centuries Greek learning was translated into Arabic following the Muslim conquests and the establishment of a court in Baghdad. After 1100 a great deal of translation took place from Arabic into Latin, led by scholars from Muslim Spain—al-Andalus—like Peter Alfonsi (c.1062–1110). Peter was born a Jew and converted to Christianity in 1106. He translated from Arabic and Persian moral and ethical tales, wrote on astronomy, and composed polemical works against Judaism. He moved between the spheres of learning in Hebrew, Arabic, and Latin. Peter travelled widely—he may have practised as court physician to Henry I (1068–1135)—and his books were copied and enthusiastically received. The 12th and 13th centuries saw a remarkable consolidation of political units and increased European integration. 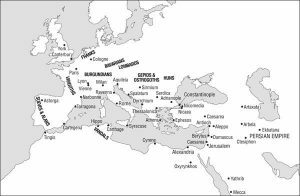 As we shall see in some detail in the chapters below, population growth went hand in hand with the development of cities, diversification of trade, and expansion in the territories of Christian Europe. An elite educated in Latin served kings and popes, bishops and princes; a system of parishes brought all Europeans into the reach of ecclesiastical instruction, ritual, and discipline. Some parts of Europe became perennial war zones: the Scottish borders, the shifting Christian/Muslim frontiers in Iberia and the Near East, and the Baltic region where crusades against pagans were waged. Violence within polities was increasingly tracked down and contained by royal administrations of justice, supported by local magistrates and with the participation of local communities. All this was underpinned by law-codes and customs, newly codified and disseminated. In the 1140s authoritative texts of church law were assembled into the Decretum, a concordance of the Christian legal tradition which aimed to harmonize apparent contradictions. It was followed in each century by new collections and commentaries, a shared legal heritage for European church courts. Kingdoms produced their own codes, but also allowed other spheres of jurisdiction, like those of landlords on their manors, and town councils over their markets and citizens. Legal expertise developed in hubs of commercial activity, like the Italian cities, and some groups regulated their own affairs, like Jews and Muslims in Spain, and foreign merchants in Venice. Dynastic ambitions caused monarchs to build effective bureaucracies for the management of their finances in peace and war, and for the delivery of justice. Occasionally resources had to be mustered in desperate attempts to defend territories, as the rulers of Poland, Hungary, and Rus’ did in the early 1240s against Mongol attacks. But dynastic ambitions also led to expensive wars of conquest, like Charles of Anjou’s seizure of Sicily in the 1260s, Edward I’s conquest and settlement of Wales two decades later, or the Hundred Years War (1334–1453) between England and France. The later 13th century also saw a decline in the rate of growth and ultimately the marks of famine and economic vulnerability in many regions: the price of foodstuffs rose, and the size of peasants’ land-holdings shrank under population pressure. In some regions cash crops had displaced food crops—dyestuffs were planted aplenty in Picardy and vines in Gascony—so the balance of humans, animals, and food became increasingly precarious. Around 1300 the Little Ice Age set in, and its wet and cold meant that the extent of European land suitable for cultivation decreased considerably (Map 3). The famine which ravaged northwest Europe (1314–17), and the great calamity of the Black Death (1347–52) put all the arrangements we have been surveying to a deadly test. Unprecedented flooding and fiercely cold winters from autumn 1314 meant that agricultural yields were down—sometimes by 40 per cent. However integrated the European economy had become, it failed to provide food where it was needed. This failure was exacerbated by the tendency of landlords to hoard foodstuffs and thus speculate. Just as the next generations were beginning to recover and population to grow again, the Black Death—what is now commonly agreed to have been the bubonic plague—reached Europe. The disease had spread across central Asia over the preceding decades, reaching Europe by vessels that traded between the Black Sea and Italy in 1347. This disease was initially borne by fleas that had fed on infected rats and then passed the disease on to humans. Infected humans developed pustules on their bodies, especially around the lymph nodes, and a high fever; they usually died within ten days. A pneumonic version had a swifter effect, with death coming even more quickly. While mortality rates differed across European regions and settlements, it is estimated that close to half of the population perished. Nor did it stop there, as the plague returned in the 1360s and 1370s, and in many areas in the 15th century too. The world was truly turned upside down as disease, loss, and bereavement affected all Europeans. The population did not reach early-14th century levels again until well into the 16th. So many of the assumptions about the European economy had to be rethought. Labour was in great demand, but less food was required to feed the depleted population. Rulers attempted to intervene and direct the response by legislating the changes away with fixed wages and restricted worker mobility. It is not surprising, therefore, that the later 14th and 15th centuries saw a great deal of urban and rural unrest all over Europe. Landlords sought to move from the labour-intensive cultivation of arable lands, to more diverse activities such as mining, pasture, and fisheries. Cities became more aware of the responsibilities they had in maintaining public health through care for urban spaces. Europeans invented new ways of commemorating their many dead; they also became more impatient with those deemed to be lazy, and without settled abode or regular employment, the ‘undeserving’ poor. Europe continued to change in shape and population size in the later centuries of our period. The Baltic region became part of Europe following the conquest of Livonia by the Teutonic Order in the 13th century and its settlement by German-speaking colonists; the Greek-speaking Byzantine Empire was conquered by the Ottomans in 1453; and Christian rulers conquered large parts of al-Andalus, a process which ended with the fall of Granada in 1492. Europeans of many ethnicities and religious affiliations confronted the Mongols in Hungary, Austria, and Poland. Crusaders continued to imagine the conquest of north Africa and the reconquest of the Holy Land; one group came upon the Canary Islands in the late 14th century and established vestigial rule there, with papal blessing. Throughout these later centuries Europeans lived abroad in enclaves and trading stations—funduqs—in Alexandria, Damascus, Constantinople, Karakorum, and Jerusalem. Along the trade routes pilgrims travelled too, as did curious scholars and would-be missionaries. By the end of our period the eastern Mediterranean was ruled by the Ottoman dynasty, and to the west explorations of the coast of Africa were encouraged and financed by the kings of Portugal. It is common to end this period in 1492 with Columbus’ journey which saw his arrival in the ‘Indies’. Yet Columbus seems far more to belong to the traditions of European travel, cartography, and royal patronage of trade, infused with a sense of Christian mission. The ‘Middle’ Ages? What remains of this concept of ‘middleness’? Not much. 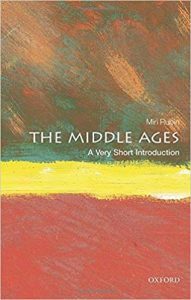 From The Middle Ages: A Very Short Introduction, by Miri Rubin (Oxford University Press, 12.01.2014), published by Erenow, public open access.